Long/short credit was Chenavari’s first strategy when the firm was founded by Loic Fery alongside partners such as Brasil, back in 2008. The approach has been adapted to fit the UCITS framework, and the weekly liquidity of the fund. Upon launch in June 2015, the UCITS experienced some “teething troubles” when attempting to replicate the strategy pursued by the offshore multi-strategy fund, so it was “relaunched” in 2016 with a redefined structure and mandate based on an investment policy completely aligned with UCITS. The UCITS now has limited thematic and position overlap with the offshore vehicle, and avoids some instruments used by the offshore fund, such as bespoke structured credit tranches that are not deemed to be sufficiently liquid. The main instruments for the UCITS are cash bonds on the long side, with various derivatives – credit default swaps (CDS), total return swaps (TRS), credit indices, and options on indices – used on both the long and short sides. The UCITS also avoids distressed names including those with a CCC credit rating, and private placements. Notwithstanding all this, its investment universe still has a 95% overlap with that of the offshore fund. A fully independent team, including a dedicated credit and FX trader, Olivier Doukhan, is exclusively dedicated to managing the UCITS. The UCITS team portfolio managers include Brasil, who has 20 years’ buy side experience, and Stephane Parlebas, who joined the firm in 2010 having previously managed structured credit at Lyxor Asset Management. Both report to Deputy CEO and Head of UCITS, Vincent Laurencin, who joined from Exane in 2015. 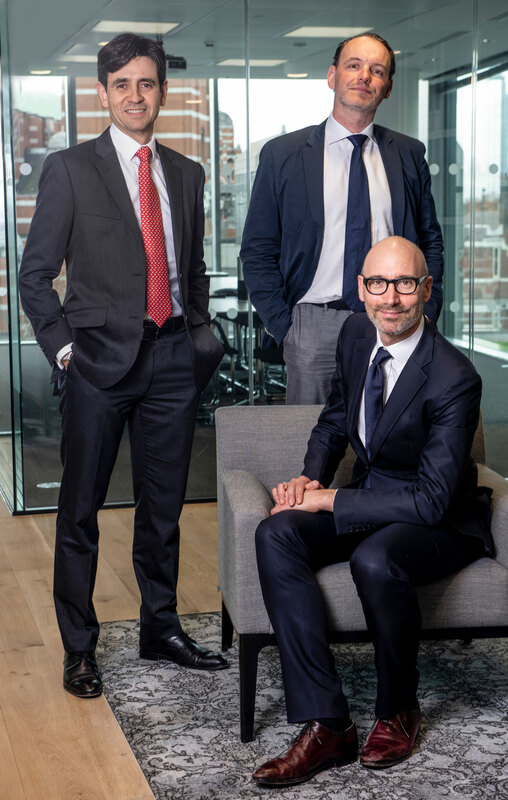 Seated: Vincent Laurencin, Deputy CEO; Right standing: Stephane Parlebas, Partner, Senior Portfolio Manager; Left standing: Demian Brasil, Partner, Senior Portfolio Manager. Though the UCITS has a distinct team and strategy, like all Chenavari strategies, it benefits from a cross-fertilisation of ideas within the firm, drawing on insights from 35 investment professionals. As of 30 December, Chenavari manages assets of USD 5.1 billion, and is one of The Hedge Fund Journal’s Europe 50 managers. Vehicles include two London Stock Exchange listed funds and some CLOs. Expertise spans distressed debt, risk retention and risk transfer transactions involving regulatory capital. As one of the first European credit hedge funds that expanded into the private credit space in 2011, the manager also runs USD 2.2 billion in a growing spectrum of illiquid credit strategies. These encompass a wide range of European private credit investments: consumer finance, specialty finance, direct lending, real estate lending, and trade finance, all of which aim to pick up illiquidity premia that are not relevant for the UCITS. Complexity premia are to some degree germane for both liquid and illiquid credit however. Chenavari are active across the entire capital structure and also create their own CLOs. The structured credit desk can provide insights helping to gauge market appetite in terms of the demand and pricing of certain types of loans and risks. Meanwhile, Chenavari’s asset-backed security experts have their fingers on the pulse of the ongoing saga of bank deleveraging and recapitalisation. “Sales of Non-Performing Loans (NPLs) were an important trend in Italy last year, revealing where the market clears,” says Brasil. Chenavari has a pan-European purview, investing in Southern as well as Northern Europe. Chenavari’s regulatory capital teams can also provide inputs and insights into the nuances of Basel and ECB regulation and other rules. The firm’s convexity desk, trading options on credit indices, is another valuable resource for market intelligence in addition to implementing the convexity strategy for the UCITS. “The ECB’s multiple QE programmes (PSPP, CSPP, CBPP3, ABSPP), which peaked at purchases of EUR 80 billon a month, had helped to make credit a one way bet for around three years since they started in 2015,” says Brasil. Income reinvestment apart, the cessation of fresh asset purchases in late 2018 has been an important market driver of the sell-off as the market started positioning for the tapering. Investment grade CDS spreads that bottomed out at 40 basis points, have more than doubled to about 88 basis points in early 2019, contributing to negative returns for the sub-asset class in 2018. High yield and financial paper have also been hurt, with longer duration issues predictably suffering most. The general downdraft has been exacerbated by company-specific mishaps around the trade war, China’s slowing economy and Brexit fears. Some funds facing redemptions have become forced sellers. Not only has the level of credit spreads increased, but the range has also widened. “We are still discovering how the market behaves with QE unwinding, and we could see further widening,” observes Brasil. “European credit spreads have blown out, but as of January 2019 had not reached the levels seen in early 2016, let alone those of other market troughs in 2002, 2008, or 2012,” he continues. Those four entry points allowed investors to generate double digit returns over the subsequent one-year periods, and such a scenario is not entirely implausible in 2019. Though spreads are not as wide as on those four occasions, the default environment now is also much more benign, so spreads adjusted for expected default losses are quite attractive. Defaults are low partly because issuers have been able to extend maturities out to 2020 or beyond, which is why Brasil expects default rates to edge up only gradually. But Brasil does not feel the time is ripe for a long only approach. Even with very few defaults, spread widening can generate profits on shorts, and in late 2018, Brasil was finding single name opportunities mainly on the short side. Shorts have included: bonds of cyclical companies trading close to par that repriced in the light of slower economic growth; petrochemicals firms vulnerable to lower oil prices; and special situations based on specific events such as changes in guarantees between operating company and other entities within corporate structures. In early 2019, more value is starting to appear, which increases the number of positions on the long side. Certain longs are anticipating event catalysts, such as the call of specific bank issues that are about to lose capital treatment under Basel rules. The basis between cash and CDS has expanded as cash bonds have widened out more than CDS, which opens up opportunities for an “arbitrage” negative basis trade (NBT). Chenavari is not pursuing the NBT per se, but is in some situations able to improve yield by hedging cash bonds with CDS. In early 2019, Brasil is of the opinion that high yield is much more attractive than loans on a relative value basis. Bonds have seen a massive repricing but loans (at least in Europe) have barely moved as they seem to have sticky demand. The UCITS anyway has a bias towards bonds because its profits come predominantly from price movement rather than yield, and fixed coupon instruments clearly offer more volatility and trading opportunities than floating rate ones. Of course, structured credit CLOs offer higher yields in return for their implicit leverage but the UCITS has a very limited budget for structured credit, for liquidity reasons: it can invest in some structured, iTraxx Main indices, but not tranches of CLOs. In the financials bucket, the UCITS emphasises on Non-Preferred senior, Tier 2 and AT1 (CoCo) securities. An internal limit of 15% of NAV (and 50% of the financials bucket) applies to riskier CoCos and AT1s, which the strategy was net long of in 2017. Most trades however are pairs trades looking to profit from idiosyncratic mispricings. It has been short of selected names in 2018, and keeps a close eye on technical dynamics that saw net outflows from the asset class during the last seven months of 2018. Similarly, within the corporate strategy, the approach is to maintain fairly flat beta and focus on name-picking. Sector themes could include the impact of the trade war and new emission regulations on auto-makers. The base case weightings are 40% in corporate long/short, 40% in financials long/short and 10% in convexity, and these buckets tend not to fluctuate by more than 5% or 10%. There is a moderate correlation between the first two books, but neither is correlated to the convexity one. The convexity strategy, which trades ladders of options on investment grade credit indices, such as CDX IG and iTraxx Europe, is in effect, short of dispersion and long of correlation. This is an actively traded strategy that adjusts exposures to different maturities, issuers and strikes. The climate of widening dispersion over the past year has not been conducive to this sub-strategy, but implied correlation in late 2018 reached relatively low levels at which it may be attractive to put more risk on. The convexity strategy is also, to some extent, expected to be a tail risk hedge for the overall fund; though the corporate and financials strategies each have their own hedges. Post-crisis, credit market liquidity has been a source of angst for some investors. The general trend has been one of deteriorating liquidity, with hiatuses making it difficult to trade whenever sell-offs occur. “Banks lack a balance sheet to hold inventory and do traditional market making, so they have become in effect agency brokers, crossing the market inventory,” says Brasil. “Although a substantial part of the market is held by long term, ‘real money’ investors who basically buy and hold, the part that is more actively traded creates plenty of volatility.” Indeed, volatility has picked up in the second half of 2018, and Chenavari therefore feels that a decent short book is needed. The fund’s overall exposure has also been scaled back in late 2018 to stay inside the volatility target. “Bid/offer spreads on CDS range from 0.20% on liquid high yield, to 0.50% on illiquids, and is unpredictable for distressed securities,” continues Brasil. “Bid/offer spreads are wider on cash bonds, perhaps as wide as 0.75 or one whole bond point, and it is not clear if you can execute at those levels.” Chenavari has a wide suite of counterparties, including over 20 on the cash side, and multiple ISDAs signed on the CDS side, at its disposal, in order to maximize opportunities for sourcing liquidity. He argues that there is no inherent reason why a credit UCITS cannot offer daily dealing, but that some daily dealing UCITS, including long only funds, could be running a liquidity mismatch relative to the sub-asset classes they invest in. Given this backdrop, and Chenavari’s internal analysis of liquidity conditions, Brasil estimates capacity for the UCITS, which currently runs EUR 120 million, could be in the region of EUR 800 to 900 million. The UCITS is marketed mainly to institutions, predominantly in Europe, but with some interest from Latin America, where Brasil, like many financial analysts, studied Electrical Engineering in Sao Paolo in Brazil. Chenavari’s proprietary risk management stress-testing, using in-house analytics, includes plenty of historical scenarios, such as the 2008 crisis, the 2011 European Crisis, the 2014 Taper Tantrum, Brexit, the Italian political crisis, and Spain, as well as parameters such as GDP slumps, unemployment spikes, inflation overshoots, currency collapses, curve shifts, interest rate shocks, and recovery rates. These stress tests have so far proved reliable and the fund has not shown much performance volatility around events such as the Brexit referendum, the French election and the Italian constitutional referendum. “Lyxor has been a great long-term partner, which provides another layer of risk management,” declares Brasil. He is cautiously optimistic about the outlook for the strategy, and Chenavari are keeping a close eye on economic data. “The ECB remains very relevant, and we expect it could step back in, if Europe descends into recession,” he says. For the time being, wider dispersion in credit markets is primarily improving the opportunity set for name selection.